What is pDCPD ? pDCPD is the abbreviation for polydicyclopentadiene, a thermoset polymer plastic material. Thermosets like pDCPD are distinguished from thermoplastic materials, the other main group of plastics, because, unlike thermoplastics which revert back to liquid form under excessive heat, thermosets will remain in a post-cured form. 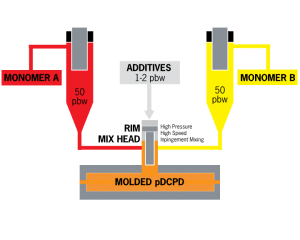 pDCPD and other thermosets resist melting because of the process by which they’re created: two dissimilar liquids are mixed together, creating high temperatures that foster cross-linking between molecular chains. This cross-linking contributes to thermosets’ heat resistance. Dicyclopentadiene (DCPD), a liquid monomer, is catalyzed by an active metal component via the ring opening metastasis polymerization (ROMP) process. The monomer and catalyst can be mixed by hand, by Resin Transfer Molding (RTM), or by Reaction Injection Molding (RIM). Corrosion resistance is another beneficial characteristic of pDCPD, which has been used in the chloralkali industry for more than 20 years. pDCPD’s chemical resistance for alkaline solutions is superior to many of the other thermosetting plastic materials available today. It also has good chemical resistance to acidic solutions. A list of chemical resistance for various acids and bases is available upon request. Other characteristics, such as tensile and flexural properties, can be increased several times over through the addition of fibers, either microfibers, long fibers, or continuous fibers. Superior impact properties are also achieved by adding various fiber lengths and types. pDCPD can be processed or molded using steel, aluminum, or composite molds. Osborne Industries’ composite mold building capabilities provide a low-cost solution for prototyping and short-run projects, allowing innovators to trial new design concepts before moving to the production phase. Low in-mold pressure allows for the use of aluminum tooling, providing a lower-cost solution when compared to competitive processes that require steel molds and large presses. Surface finish yielded from aluminum tooling is often found to be acceptable, however, if Class A surface quality is required, polished steel or nickel plated tooling may provide the best solution. pDCPD molded parts can also have variable cross-sectional thicknesses throughout the part for bosses, ribs, structural features, or style. Some care is necessary when designing parts with variable cross-sectional thicknesses to ensure phantom lines are minimized and differential part shrinkage is controlled. Several types of finishes are possible for pDCPD molded parts. The final part can remain unpainted, painted, or even coated with a special material that is applied during the molding process. Contact Osborne to discuss your next project. 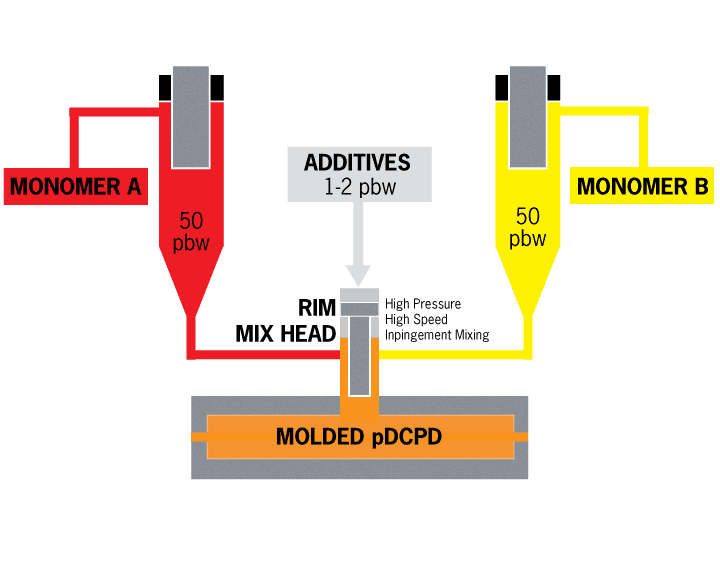 Molded pDCPD may be the answer to your project requirements.